In September 2017, The Big Issue published this story in their My Word section issue # 545. Because they rely on their vendors selling hard copies (and I admire their plan) they ask writers not to put their work up on line at the time of publication. Here it is now, for your enjoyment. 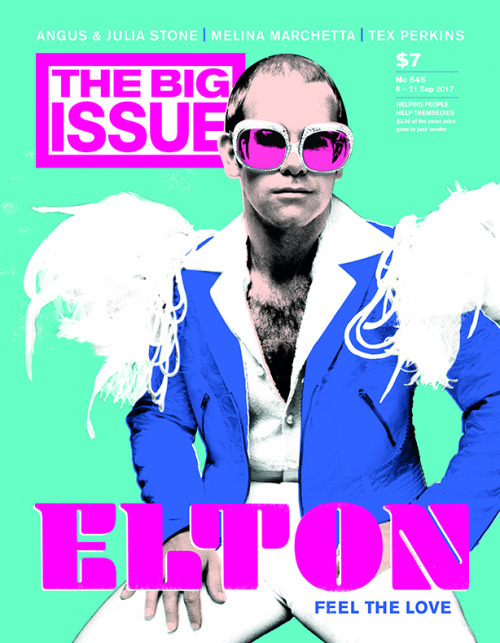 Great to have a story about dressing up when Elton is on the cover! When our close friend Ray died, the funeral was set for a Friday. Both our young adults returned home during the week. They had known Ray all their lives. The night before the funeral my son showed me a lion suit he’d borrowed for a party over the weekend. It was a onesie – yellow and furry with the hood fringed by a healthy mane. Despite its off-the-shelf origins, Ben was pleased with it. He thought Ray would have liked a funeral followed by a party. He was right. We were up early on Friday morning. The funeral was in the country, over an hour away and my husband and I were both giving tributes. We had to get out of Melbourne in the peak hour traffic and arrive before it all began. There would no doubt be a crowd. A lot of people loved Ray. In the kitchen, our young adults were making toast and their own last minute arrangements – deciding whether to travel in convoy or come with the ‘parentals’. The logistics were complex: directions, train timetables, contested routes and travel times. The bathroom was too busy, everybody wanted the iron, the hair dryer didn’t work, the mobile phones kept going off. After one call too many, I snapped at my husband. This was not what I wanted to be doing on the morning of our friend’s funeral. I fled to the front room to collect myself; heart thumping I stood staring out of the window, my back to the door. The morning was overcast and dull. I thought about the Chinese proverb my tribute was based around. “If you keep a green bough in your heart, the singing bird will come.” Ray had loved the birds that visited his kitchen window and native garden; he noticed them to the end of his life. Right now I could not hear a single bird above the traffic. My heart was banging so fast I couldn’t imagine a bird wanting to sing anywhere nearby. My eye caught a small framed photograph on the window ledge. A print from a Kodachrome slide taken when I was eighteen months old. On my head is a black velvet hat with draped netting and I am looking directly into the camera with wide eyes. A soft shawl scoops across my shoulders and I stand gripping a large patent leather handbag with an impressive gold clip. According to my mother this photograph marks my first foray into costume. When we were growing up, my brother and I owned few new clothes and for a long time no TV, but we had a great dress up box. On Sunday nights in the lounge room we did re-enactments of stories and made animal dances to music our mother improvised on the piano. When other kids came over we made up plays, raiding the dress up box for props and costumes. When I had children, I assumed that a dress up collection wasan essential. My brother worked in set design and supplied a genuine pith helmet, serious cowboy hat and bags of frothy outfits and sober suits. A regular op-shopper I found endless jester hoods, fairy wings and satin capes. You could be anyone really; it was escapism without screens, aspirational without a hefty price tag. There was a time, when our teenagers were in high school, that my beloved – always one for a clear out – proposed ditching the dress ups. “Don’t even think about it!” I said, as his hands hovered over the baskets. Now on this grey Friday, as I stood weeping and looking out of the window, I heard the door handle click behind me and a soft shuffle on the floorboards. I found myself ensconced in a bear hug – except that it was a lion. My son, six feet plus, clad in his lion suit onesie, wrapped his yellow furry arms around me. My shoulders dropped and a little sigh puffed out of me. After a brief moment held in his big lion paws, I wiped my cheeks and nodded my thanks. Heading north in the car, Ben was back in his sharp blue suit, my daughter towel dried her long hair, my husband navigated the traffic. Silently I sang my thanks for a lion’s hug – and for the knowing that comes with all those silly games.